But not one of the chest-thumping screeds has provided an understandable mental image of what a 40 BMI looks like. “Fat” is the most common adjective, but it does not even come close. Try “morbidly obese,” because a 40 BMI is the threshold for this condition. Such pilots would unlikely be able to squeeze into the cockpit let alone the pilot’s seat. Let’s put it another way. What is your BMI, your ratio of height to weight? If you don’t know, here’s the link to a calculator. Now, keep adding weight until your BMI reaches 40. How much will you weigh? At 6-foot-5 and 240 pounds, my BMI is 28.5. The normal BMI range is 18.5 to 24.9. Like many of my age, my BMI is in the “overweight” category, which starts at 25, and it is 1.5 points shy of obesity’s doorstep. And it’s not even close to the FAA’s 40 BMI trigger. To reach that I’d have to push the scale to 340 pounds. A 6-footer would weigh 295 pounds. When was the last time you you saw a pilot of this size getting in or out of an airplane? So why is everyone giving the impression that the requirement imposes dire consequences on all overweight aviators? Let’s be honest here, many other obesity-related conditions rank higher on the medical certificate denial list. Listing the health conditions related to obesity, University of Rochester Medical Center starts with Type 2 Diabetes and high blood pressure before it gets to joint problems, sleep apnea, acid reflux, depression, infertility, and incontinence. If there’s a list that motivates the proper combination of diet and exercise, this is it. In his editorial discussing the new policy, Federal Air Surgeon Fred Tilton said the BMI trigger would, in time, be lowered, “once we have appropriately dealt with every airman examinee who has a BMI of 40 or greater.” When that will be is anyone’s guess, but what I’d really like to know is how many applicants have reached this register? Maybe most of them are air traffic controllers, to whom the new policy also applies. Some have rightly said that BMI is an imperfect measure, that fits individuals, such as NFL players, have higher BMIs because muscle weighs more than fat. True enough. Take, for example, the late, great Reggie White. At 6-foot-5 and 300 pounds, his BMI was 35.6, still well under the FAA trigger. And Reggie died from cardiac arrhythmia aggravated by sleep apnea. Lest you think I care naught for the obese, until a month ago, I was—by my BMI—one of them. But thanks to my new doc, who this last January presented the consequences of obesity in terms that resonated with me, diet and exercise have trimmed 25 pounds from my BMI, moving me into the overweight category. And I have another 25 to go. Ultimately, what bothers me most about the outrage against the FAA’s BMI trigger is that almost everything I’ve read about it strongly suggests that commenters jumped on their online soapboxes without thinking things through. I think most pilots will agree that in flight, acting before thinking often leads to an undesirable outcome. And then there are the social implications. When the financial costs imposed on those who suffer from the medical conditions associated with morbid obesity is more important than their quality—or continuance—of life, what does that say about our concern for the family of aviators? This entry was posted on Monday, November 25th, 2013 at 12:30 am	and is filed under Aerospace, Airline Pilot, aviation safety, Blogging, Business Aviation, FAA, General. You can follow any responses to this entry through the RSS 2.0 feed. Both comments and pings are currently closed. But apparently they do, unless they just walk around the layover hotel lobby in a pilot uniform. I see them, and I wonder how they do fit. I know they must not have started out that big, and I wonder also how it came to be. Actually, that’s the NORMAL category. Overweight begins at 25. As for the outrage in the aviation community, you seem to be under the impression that pilots are upset because we feel there’s nothing wrong with obesity. That’s incorrect. We are outraged because the proposal uses a metric — BMI — which was never designed to apply to individuals. It’s an index which was designed to apply to populations and has been shown to be ineffective. Weightlifters are often in excellent health and yet have high BMIs. BMIs are averages, and as you’re aware there are many different body types. There are so many reasons to be angry about this. Try these on for size (get it? ): the career-ending expense of sleep studies (which more than one individual who’s been through them has stated “nobody passes”); the lowering of the BMI threshhold to an unannounced level (25? 20? ); Tilton’s stated aim to catch “everyone” who as OSA when it’s a proven fact that people in the normal BMI range can also get it; the already shrinking size of the pilot population; the general unhappiness with Federal incursion into our bedrooms, healthcare, privacy, and elsewhere… the list is long and I have not come close to exhausting it. And here’s the kicker. If we’re going down this road, perhaps we should pull the medical certification of anyone who smokes, drinks, has a family history of strokes/ incapacitation, etc. until they’ve been extensively screened and tested by specialists in each of those areas. Because all those things increase the chance of heart attack, don’t they? What about people who live high-stress lifestyles? Those who don’t eat right? This is all theatre, and it won’t stop with apnea. Medical certification has not been proven to increase flight safety whatsoever. Airline pilots with first class medicals sometimes die in mid-flight, while LSAs and gliders have been flying around for years piloted by individuals with no medical certification and you don’t see or hear of accidents caused by it. This proposal from Dr. Tilton goes in the wrong direction. We need to eliminate the third-class medical altogether, not increase the burden on what’s left of the GA pilot population to the point that the skies are silent. I think you said what a lot of my professional pilot friends are too Ron. MAYBE we would have listened to this pitch from Dr. Tilton if it had been proposed the way it should have … through an NPRM designed to gather feedback BEFORE a rule is implemented. You’d have thought someone at FAA would have told him that’s the best way to gather input and reduce the flack the agency receives over silly ideas like this. But then from what I’ve seen at the top, neither FAA nor the DOT has anyone in charge who really seems to have a clue about the issues we’re facing in this industry. I’m a 51 year old, third class GA instrument rated pilot. I also swim 1 – 2 miles 2 to 3 times a week and recently was undefeated in my age/rank at a national karate tournament. My 8 pack is more like a 4 pack now, but I just calculated my BMI, 27.7. I.e. : “overweight”. This is yet another example of the tyranny of our Federal government. Lots of rules, fees taxes and waste and not an ounce of accomplishment. It’s just like the “do-gooders” who’ll end up killing pilots and passengers by getting rid of the small but necessary lead in AVgas. Elitist, arrogant and profoundly ignorant of how life outside of government works. But with better benefits and a pension you and me get to forfeit our earnings to support. I’d like to meet a few of these FAA dudes in my next tournament, but we only fight light contact. I don’t hate anyone, I just wish they would find something productive to do with their lives and quit screwing up the best country in the whole wide world (EVER!) with their good intentions and bad results. Happy Thanksgiving and Let God Bless America Again! There is no evidence that this is a problem for GA. They are doing the same thing for the trucking industry. So does that mean everyone who has a driver's license should pay for a Sleep Test? If you believe this then take your Statins and get some sleep. Mr. Spangler literally illustrates his narrow position with the graphic of the silhouettes. It is as if all people have that silhouette with that BMI. I am a 35.5 and I don’t look like that catagory. In order for me to be in the ‘normal weight’ at my current height at age 48, I would have to weigh no more than what I weighed when I was a very active HS athlete in great condition and still 3 inches from my adult height in the 8th grade. It is true, very few if anyone ‘passes’ their sleep study. However, I would agree that many people in this nation, including pilots do not manage their health – not a focus on weight. AME’s could help guide and make the sytem more effective at the individual level. I’ve a BMI of 31. That’s 6’1″, 240#. I’ve a 46″ chest, 18-3/4″ neck (another apparent no-no), a 42″ waist, and size 13 feet. I’m a giant midget with a 31″ inseam and sit taller than my long-legged 6’5″ friends. I also have a BP of 120/70 and an at-rest pulse of 60. No diabetes, normal cholesterol and liver. My doc suggests I could lose a few pounds (I agree), but I haven’t been 195 pounds in 40 years. That was when I was 17, in fighting trim, and two inches shorter. BMI is an idiocy when applied individually. Where’s all the supporting documentation of flying incidents/accidents with contributing factors and causes due to sleep apnea. This entire line of thinking is a red herring. My BMI? 31. My measured (via dunk tank) body fat? 16%. Yep, I lift a lot of weights (and sleep quite well thank you very much). Don’t make me waste my money on pointless testing. Ron Rapp is right, and the FAA could have been much more reasoned and American in its approach. But then, today government is overflowing with power-mad tyrants, and we will probably not be willing or able to change that. OTOH, my BMI is 42. I haven’t flown in nearly a decade. The medical complications of obesity are real. Anyone with a BMI of 40+ really almost certainly has OSA. I know how I feel after 8 hours horizontal without a BiPAP. Not fit to fly – that’s for darn sure. We also need to get the bureaucrats out of the sleep study business. What a racket! I self diagnosed three years before I was able to get “a study”. The $2,000 “study” turned out to be a gimmick to try to get me to have “another study”. I called BS, and bought a self-titrating BiPAP out of pocket. Smartest thing I ever did, besides learning to fly while I still had my health. It looks to me like someone in the FAA has a friend who is a sleep study doctor and needs more patients. They can’t even handle the Special Issuance’s they have now in a reasonable time. Why do they come up with this when they should be evaluating the EAA/AOPA request to eliminate the 3rd class medical for Sport pilots in airplanes of 180hp or less, fixed gear, no night/instrument flying, and who take a course on making good evaluations of health and mental ability to fly before actually flying. This should also be something of interest to them but it seems to have been tabled, is it time to sue the FAA for not doing the job they are requested to do and are required to do. There should be a requirement that they have to at least respond and give a time frame of when they will get around to evaluating it. Maybe it’s time to call our congressmen and have a chat. With the GA Caucus that has been expanding recently maybe they could get the FAA to do the notice of rule change for change of medical standards and elimination of the 3rd class medical requirement for Sport Pilots to the same requirement as an LSA pilot. We are going to have to step up to the plate if anything is going to get done, so call/email/visit your congressman and let him know how you feel. If you’re looking for the data supporting this latest FAA effort, you might just be waiting awhile. No one I know has seen anything. This is simply a stand the flight surgeon and some of his people took using BMI as their guide. So I used to fly professionally and left for a career in Dentistry. Let me tell you that not breathing when you sleep occurs many, MANY times because of large tongue, big tonsils, and obstructed nasal passages. Yes weight is a factor at times as well, but I have had SSOOOOOOOO many people come in that are using those CPAP machines and they just end up sleeping less because they are so uncomfortable and NOISY!! When my patients complain of this I recommend trying a simple jaw projector that moves the lower jaw forward. Anyone that has taken a CPR class know the “jaw thrust” method to clear an airway. Well this little appliances do just that and they are cheap and easy to operate. I have studied this myself and 93% of my patients that were using a CPAP now do not use it and use this simple appliance with BETTER results. I am not saying this will work for everyone … true sleep apnea when the person literally stops breathing due to other physiological factors does truly exist, but I fear that what we are seeing is another epidemic of “over diagnosis” by the industry. You see, people make money from those machines just like I make money from the appliances that I recommend, let’s be honest. Difference is that dental insurance will not cover my thing and medical insurance DOES cover their thanks to a heavy lobby effort by manufacturers. You see this in so many things from Cholesterol and other medications to treating ADHD, or ADD or whatever other new letter soup that invent next. Its all about selling “accessories” and padding the bill to make up for a shortfall of profit due to the cutting of provider fees. It is ALL about making money and has very little to do with actual health. And the other guys are right … this is yet another big government handshake with bid industry to screw the peeps. No way that the pilot community should be cool with this. ALL pilots need to stand up and fight. Write a letter to Congressman Graves in Missouri … he is VERY helpful on aviation issues. And make sure to WRITE the letter .. do not type or e-mail people, that is less effective. It will take all of 10 minutes to do and it will help save your career and those of your fellow pilots. Do not let the mercantilistic government that exists today ruin you life tomorrow. Stand up and FIGHT BACK!!! Thanks for catching my error on the normal range of the BMI scale, I’ve corrected it and a few other typos that got by me. Your comments have been interesting, and I agree that BMI is not a very accurate sorting tool, so what would you recommend as a more accurate replacement? As for pilot-specific apnea research, does the dearth of such studies mean that pilots are immune from the consequences proven in other medical studies of apnea? Maybe its the devil’s advocate in me, but common to many of the comments are the words that diminish the overweight BMI category with reports of atypical habitus and excellent health. But this is only human nature, I suppose. I used to do the same thing, but every morning when I got out of the shower, there was this old, fat, bald guy waiting for me in the mirror. This is the most accurate measurement of anyone’s condition, said my new doc. BMI is just a number that society, from docs to insurance companies to the FAA, use to try and make some sense out of human diversity. It’s not perfect, it’s not as accurate as the mirror. Ultimately, he said, you determine what meets you in the mirror every morning, and the key is burning more calories than you consume. Make all the excuses you want, he said, the mirror doesn’t lie. Other numbers determined by my physical were more concrete: a higher blood pressure, pre-diabetic blood sugar, and elevated cholesterol. With a family history of apnea, he asked if I snored, which I don’t. Like many of the commenters here I offered the same rationalizations to my condition, which my doc, a very wise man for one so young, clearly understood and appreciated. And then he asked me if I’d bet my life on the rationalizations I’d just shared. And that got me thinking about the old, fat, bald guy in the mirror. I hear your comments on rationalization and maybe I’m rationalizing, too, but my doctor and I talked about my weight at my last physical (last week). It has crept up a few pounds since my last physical and I was already starting to take steps to rectify it, but had the proposed guidelines already moved down to my current weight (BMI of 27, but triglicerides 116, cholesterol 160, BP 110/60, resting pulse in the 60s, and I ride my bicycle several thousand miles a year), I would have been forced to get a $2000 test that my primary care physician feels is unnecessary. Also, is this a one-time thing or if I’m still above the guideline in 2 years (yup, I’m over 40 and a third class medical), do I need to get it done again? I just think that the FAA could go after health issues among the pilot and controller population in a little more rational fashion. Your last comment makes part of my point. You have concrete numbers that should be addressed (BP, sugar, and cholesterol). I can even understand having the AMEs look for signs of sleep disorders, but lacking any other indicator save BMI, I don’t like the idea of requiring an expensive test that my PCP deems unnecessary. This is the best argument to do away with the third class medical. No scientific or medical justification, just “sounds good to me”. The old observation of the camels nose into the tent applies. Perhaps more apropos is the saying give a rat a cookie pretty soon he will want a glass of milk. I don’t know what to make of all this, but I have a BMI of 30 and have been using a CPAP for 12 years. The new models are virtually silent, comfortable (generally), and have allowed me to get a normal night’s sleep without scaring the hell out of my wife who thought I’d died about twice a week in bed next to her. It also immediately eliminated a case of acid reflux that had scared the hell out of me for years. I don’t fly anymore, and I don’t know that BMI is a fair measure, but don’t dismiss sleep apnea. If you nod off on final because of it, you might feel otherwise. No one writing is saying they are “old, fat, bald guy[s].” They are saying they are atypical and why! I am atypical since I was born weighing 10lb. 4oz. in 1956. Mom was 5’4″ and 110#, Dad 5’8″ and 160#. (Both grew up in Europe during the war and likely were stunted by limited caloric intake). When I specifically asked my doc about the issue, he was not concerned. Your example of Reggie White is not sound. His BMI was high. He died of a heart problem. He had sleep apnea. What is missing is that his BMI caused his sleep apnea which cause his cardiac arrest. One thing is for certain, if I had a cardiac arrhythmia (as does a friend whose BMI is about 20), I would be doing a lot of things differently in my life. Your argument sure sounds like everyone would be “above average” if they just got their BMI down. It just doesn’t sound much like a reasonable basis for rule making. For a subject like this all any of can do is speak in broad terms. 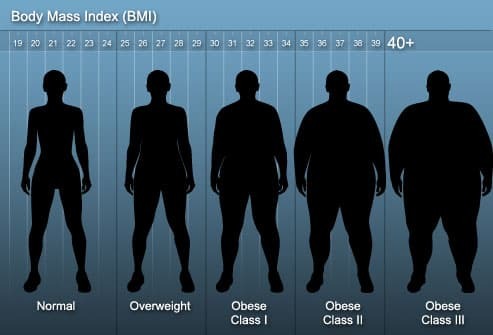 As many have pointed out here, everyone is atypical to the broad categories defined by BMI. As a skeptic, I take every self-diagnosis of good health, even my own. I might, however, cut those with a medical degree some slack. Ultimately, my point is that most pilots flying today are older, and as the comments here have shown, many of us are overweight. To keep flying, and to live longer, we have to get healthier. We also have to accept the long-term consequences of age and lifestyle decisions. Let’s face it, when we’re gone, there aren’t a lot of new pilots in the pipeline to replace us. Does this mean I support the method the FAA employed to raise this important issue? Absolutely not. Ham-handed seems an apt description, and it’s something the government is good at. But we shouldn’t let this ineptitude lesson the importance of the message. The point of a medical is to assess the likelyhood of the pilot in question becoming physically or mentally incapicated to operate an aircraft, putting themselves and others in danger. In their effort to eliminate the 3rd class medical for some light plane categories, the EAA and AOPA data show there is no statistically significant basis for improved safety provided by the 3rd class medical. Yet here the FAS is chasing a problem with no factual basis that it effects pilot performance relative to safe operation of the aircraft. Where is the science? Where is the cause and effect correlation that should be the basis of sound decision making? This is a social experiment and ALL pilots are the rats in the cage for someone’s PhD dissertation (the ATC part is smoke, their union will never let this go into effect). Forget BMI, all pilots are the target once they have their foot in the door. If you follow the logic, all large pilots have OSA and the sleep studies will show that, however everyone who had a sleep study done is diagnosed with OSA (at least everyone I know that has had one done). Then they move on to the next group with the same self fulfilling study results. Call your congressman, get them stop this waste of time and money, and while you have their attention ask them to find out why the FAA will not answer the EAA/AOPA 3rd class medical petition. Most of this discussion totally misses the point. This is supposed to still be United States of America. While we recognize appropriate medical standards, they are supposed to be formulated in accordance with an appropriate, demonstrated medical threat. I hear of no accidents attributable to Sleep Apnea. The plethora of potential medical and/or life style issues that could be an issue defy calculation. Are we going after all of them in order? Regulation by imagine. The ultimate ” I’m from the FAA and I’m here to help”. I don’t see this as nearly as much a medical issue as it is yet another government intrusion into our previously cherished American liberty. It is long past time that we Americans reassert our American Freedom. I agree with Bill McClure. This COULD be about the medical issues someday if they offer us a chance to comment before they simply institute the rule. But we’re not at that point. This sounds much like the user-fee debate. We at the FAA know what’s best, and we’re so smart that we don’t even need to listen to you folks out in the field. And even if we do, we still know better. So get ready to pay up. I hate reading a distorted analysis. It makes those in charge look like they don’t understand their own science. The real question should not be if one has SA and should they be taken off the skyway, but what are the most significant contributions to all accidents per million miles driven. Looking at these tests its clear that experience counts more than apnea. Given this result should we make youth and inexperience testable with a $2000 evaluation? No. The only correlation apnea has to accidents is with “severe” apnea. This is something a normal flight medical should pick up, like severe hearing loss, or severe mental impairment. Its bad medicine to group the wrong diagnosis with the wrong cure. I’m very surprised a blanket check of BMI, neck diameter (gulp), and apnea were given priority over checking for experience and skill. Its like saying those with high SAT scores will need to take math and reading tests because they snore. PS… Scott, your comments sound evangelical and proselytizing, you’ve discovered dieting and suddenly everyone has to listen and follow. Next you’ll discover meditation and every pilot will have to do an oooooommmm before clearing the prop. The solution is to find and work to correct those with severe apnea, because their health and the safety of others is at marginally greater risk. Most apnea is a statistical ripple, far less dangerous than a hundred other risks. For those with some apnea they should make it a rule to sleep well before all flights, indeed its something every pilot should do.along with study and practice. I must be missing the point. FAA means Federal Aviation Administration (not health administration). FAA should only have the jurisdiction to regulate the prevention of high frequency causes of accidents – not become the steward of pilot health. How can someone possibly measure someone’s weight, or perform a sleep study and determine that individual is likely to become instantly and completely disabled while flying a plane? It’s frankly not possible. Further, given there are so very few accidents in the database which might possibly be attributed to pilot incapacitation anyway, there is a strong argument to be made that the maximum possible impact of obesity or sleep apnea on flight safety is infinitesimal. And yet the FAA intends to force 100% of all pilots to succumb to sleep testing and possibly treatment, and also possibly cancel their fight certification? Yes, of course, obesity and sleep apnea are health issues. Are they leading causes of aviation accidents – not possible. In the previous post, done late I night, I may have been too harsh. There isn’t a lot of actual risk data published on sleep apnea. Most are summaries that don’t tell you the actual statistics. If there were only one additional crash in New England for example and the pilot had apnea it wouldn’t mean that was the cause of the crash. The largest study with real numbers I could find is the one of truck drivers that I posted. Their conclusion is that experience and judgement outweigh the negative of apnea among older pilots (drivers). In other words, an older driver with moderate apnea is less risk and a safer driver than a young driver in excellent health. Experience and judgement trump. Translating this data into actionable FAA medical rule making, only severe apnea where indications including high blood pressure and measureable cardiac extremes should cause mandatory sleep study. However, these same causes would be red flags already! As I have posted elsewhere and find evident here, the focus is on primary care not flight safety. No stats are presented on OSA caused flight safety issues. This issue is just the FAA interjecting itself into the role of primary care physician. That is not its role. Changing the subject into a factual monologue on the dangers of OSA and encouraging diagnosis and treatment is not, by itself, a valid reason to imperil the airmans’ medicals. I do not care for this at all, but my big concern with it is that it skips the “rule making process”.When BMI is reduced to 30,as has been reported, this will affect many of us. However that “they” can just change the rules when they want it is a very bad thing. If their is a fault in pilots today it is a lack of basic airmenship, not one of medical deficiency. Are we truly better off now that the hearing test is done with a tone generator, than when it was “a whispered voice at five feet”? I think not. This is a bad idea not because the underlying medical conditions could be bad but because the process is severely flawed. Scott, quit drinking the Kool-Aid. My doctor says this. My doctor says that. The profile of a cardiac risk is middle-aged, male, short, fat and balding. So I don’t fit that category so we obviously need more rules. My doctor wants to put me on statins. I would not have a problem with that if he was wanting to treat heart disease …… but that’s not the case. He wants to treat cholesterol which is essential in every cell in your body. By the way, I quit statins after 3 months. It raised my weight by 10 pounds which resulted in an elevated BP (which I am sure they could prescribe something for that.) Not to mention the fact that statins depletes your body’s CoQ10 which is found mostly in the heart because IT”S ESSENTIAL TO LIFE. The point here is I just want to go fly my plane on Sunday morning to an on-field eatery and have some EGGS, BACON, TOAST WITH BUTTER and some COFFEE! I’m not carrying anything else in my plane except an occasional pilot. I fly VFR day only. I fly in nice weather because I don’t want to shell out the money to fly in crappy conditions. So why do I need to pay $2500 bucks for a sleep test? If this actually happens then guess what ….. you’ll be needing to take a sleep test to qualify for a driver’s license. People that snore are obviously a risk to others on the freeway. Can you imagine the benefits? Revitalize our mass transit system. Lower our dependence on oil. Most Doctors know what they have been taught. Far fewer have actually enriched their skills by observation. This is just an addition to an already established punch-list. Put them on low dose aspirin. How many of the above have you crossed off your list? This is about the mass marketing of medicine. Big Pharma does it so why not jump on the bandwagon, eh? I expect that all Part 121 and 135 Pilots be examined. Once the general public finds that travel will be be delayed for at least 1 week due to a shortage of pilots, the airlines will be lying so long and deep that the United States will have a PERFECT air travel system. You people are joking! If anybody lives by the BMI system, half the United States would be DEAD! FACT. I believe this is a flavor of the day, blue light special, money making disease of the decade that the medical industry is rapping us with. Additionally I have witnessed and believe it�s also the excuse of the decade for individuals who get caught sleeping on the job or are involved in some type of disciplinary action related to awareness they don�t want to admit to so the �debilitating disease SLEEP APNEA� takes the fall and the individual is now a poor victim. Can anyone tell me if the sleep studies include observation of the patient in normal activities? Or is it if your breathing is interrupted during sleep you have it. Indicators are that there is a high percentage of those who are tested being diagnosed. (One writer said all are diagnosed.) Are we to believe they made it to the test by the skin of their teeth without falling asleep and somehow killing themselves on the way? Do I believe SA is a real medical condition? Yes. Do I believe SA is a threat to us all that must be identified by our government and eradicated like a plague? No. I�m a 53 year old male student pilot, 5 hours from check ride. 6ft, 280, BMI 38. Oh, and I fit in our Cardinal just Frick�n fine thank you. I hope everyone had a emotionally and nutritionally fulfilling Thanksgiving! Contrary to the suggestion of one above, I don’t drink Kool Aid…too much sugar…but I do eat bacon, eggs with toast and butter in moderation. And starting the day without my coffee isn’t pretty. Another of you summarized my point perfectly by say that there are no old bold pilots. In other words, for selfish reasons, we should take better care of ourselves for our own benefit, as well as the benefit of our passengers and those who live below our flight paths. Let me reiterate that I don’t agree with the way the FAA introduced this topic. But for those affected, or who might be affected, one would think that, for the betterment of their own lives, that they might want to get and medical condition checked out regardless of whether the FAA requires it or not. Yes, I do fly…or at least I did until the sons started college, but I hope to return to the sky after my youngest son finally graduates in a year or so. Past, present, and future, I take FAR 91.3 seriously. Striving for and maintaining one’s health is part of that, it seems to me. I’m detecting a bit of crawfishing on your part. As I read, no one is suggesting they not take care of themselves, take their doctors advice, have a sleep study done IF INDICATED, or even declare OSA during the AME exam. BMI may be correlated, even strongly, with OSA, but dropping thousands on a test which seems, anecdotally, that most will fail, in the absence of a doctor’s suggestion, to help people get a good nights sleep, so they don’t fall asleep on short final is a stretch. Most people who have OSA (which will be found in the sleep study) have no difficulty staying awake during the day. It would seem to me that the FAA would be more concerned with ANYTHING that would cause involuntary sleep during activities which require significant attention. Severe OSA is but one. Others are shift work (does that sound like airline scheduling? ), Insomnia, medications, drug or alcohol abuse, neurological disorders, narcolepsy, RLS, and chronic pain. It is recommended that assessment for the other disorders be done BEFORE a sleep study is done. I also find it quite interesting that I cannot find good statistics. I would, for example, like to know what percent of all people have severe OSA. I cannot find it. All statistics I find are incomplete with respect to the population and seem to serve an agenda. The more research I do on this topic, the more I realize that the FAA is simply WRONG. They are stomping mice while there are elephants on the loose. Apologizes for the rant, but I really would like some clarification about the DOT and now FAA�s assumptions. And the test itself. If you are overweight you MIGHT have SA. If you have SA you MIGHT not get full revitalizing sleep. If so, you MIGHT be less alert than that (normal) guy, and you MIGHT fall asleep while at the controls of your truck or aircraft? So let�s say a patient shows symptoms during a test. I assume that is done while sleeping. So when the patient wakes up, how is his/her alertness evaluated for the following 16 hours when they would be out menacing society with their groggy state of awareness? Simulators? Reruns of Lassie? Not at all? I�m really interested, so if someone out there has real knowledge or have at least been thru a test let me know. And Scott, you said �I don�t agree with the way the FAA introduced this topic.� But you clearly have no issue putting your fate in the hands of bureaucrats, be it those of the medical industry or government. I wholly disagree with that. And don�t assume to know how much others are attempting to take care of themselves from your keyboard! Oops sorry, ranting again. I’ve been through two sleep studies in fact Don. The doctor I was working with at the time took one look at me during an exam and decided I had sleep apnea, completely ignoring the others stressors in my life that I told him about first. But the sleep studies were actually pretty easy. All I did was lay there for a couple of hours with a dozen brightly colored wires stuck to my head. The result was that I might have sleep apnea and they proceeded along those lines. Surprise, surprise … none of the remedies they suggested had any effect. Then they thought I might have restless leg syndrome, but that too proved a dead end. When I finally had enough and told them I wanted my medical back, I was told I then needed a wakefulness test. They wire you all up again, except this time it’s on the day shift. Then they sit you on a bed in a completely darkened, silent room and make you stay put for an hour. The motivation … if you even look like you’re dozing during the hour, you fail. Trust me I stayed awake. Of course, I bet almost anyone in a nice warm room that’s quiet and dark would take a nap during the day to be honest, but that had nothing to do with it apparently. Total bill for all this … even though my health plan paid for most of it … about $7500 and that was 10 years ago. BTW, when the stressors in my life disappeared that had sent me to the doctor in the first place … I got better. Thank you for contacting me regarding Federal Aviation Administration (FAA) regulations. I appreciate hearing from you and welcome the opportunity to respond. As you may know, H.R. 3578 ensures that any new or revised requirement providing for the screening, testing, or treatment of an airman or air traffic controller for a sleep disorder is adopted pursuant to a rulemaking proceeding. I, along with my colleagues, recently introduced this legislation in response to the FAA’s proposal to significantly alter medical certification requirements regarding obstructive sleep apnea (OSA) for pilots and air traffic controllers. Specifically, this bill requires that any action taken by FAA regarding sleep disorders be conducted through a formal rulemaking process. While this legislation does not prohibit the FAA from implementing new medical certification requirements for sleep apnea, it does require the FAA to go through an open rulemaking process, which allows for public input, if they choose to propose and implement new requirements. While I believe in the importance of properly treating those affected by sleep apnea, I do not think that the FAA should usurp Congress’ authority by forgoing the established rulemaking process. By following regular order, all parties will have the opportunity to weigh in on the issue resulting in a more sound policy decision that effectively addresses the issue in an economical manner. As a pilot, I fully support safety regulations when they are needed. However, there is no data showing the need for these new rules on sleep apnea. This is a classic example of government searching for an answer to a problem that does not exist. As Chairman of the General Aviation Caucus, I am aware of the multitude of regulations currently hampering the general aviation industry and will continue to work with my colleagues on policies that help promote this important industry. As a cosponsor of H.R. 3578, I look forward to voting in support of this bill when it reaches the House floor. Again, thank you for contacting me regarding this important issue. Please feel free to call my office at (202) 225-7041 should you have any further questions or concerns about this or any other issue, or visit my website at http://www.house.gov/graves for more information. Thanks for sending this along Collin. Like Sam Graves, I’m still left wondering precisely what the FAA hopes to gain from this effort to skirt the rule-making process we’ve all come to count on. Why would they start this battle now? Almost as if they wanted to distract us from something else don’t you think? @Robert Mark — good question. What are they really up to??? Hard to say. Perhaps they are trying to set a new “standard”. Now would be the time to try this and you can think of the carnage that could take place until it reached the Supreme Court for a ruling, and even then it is not necessary that they will stop doing the illegal act. Remember that it is the Administrative branch that is supposed to administer and ENFORCE the law. If they feel that they do not want to enforce it (think immigration) then they simply do not. The current administration seems to like to push the limit as far as using it “authority”. I do not think they are up to anything at this point except perhaps seeing how far they can go without backlash. By the response here and everywhere in the aviation community, I have a feeling that this will not go anywhere. Pilots need to be heard, keep talking, blogging and by all means write your legislator at least once a week on issues of the day. The more important number that I don’t see anyone talking about here, is the neck measurement, which must be less than 17 inches. So in my case, (my BMI is below the 40 threshold) I get pulled into the sleep testing because of the circumference of my uniform shirt. I too have never met anyone who has �passed� the apnea test… because let’s face it, there is money to be had when someone �fails�. I’m all in favor of good health, but I just don’t see the rule makers having to cope with the same yardstick that pilots are measured by. I love how the medical community is always so quick to judge others… I am sure they would be a little more cautious if the same requirements were applied to the MD certifications. I think that a doctor who has OSA may not be “Fit To Diagnose”. As part of the new FARs I am required to sign a statement that I am “Fit To Fly”, yet a Doctor who has been on a 48, 60 or even 72 hr shift with very short naps in the E.R. Is aloud to make life or death decisions. There are no rest requirements for them to be in a certain health condition to preform their job. No mandatory time away In a 24 hr period. I’d say let’s do a study on how many people are harmed by mis-diagnosis or malpractice and compair that to the aviation community’s safety record. Don’t even get me started on mandatory drug and alcohol testing in those professions. Bravo R.J — very well stated. I think we defiantly need mandatory drug testing on all elected officials and all of there staff, not to mention ANY PERSON that works for the federal or state govt..